Jack Downs breaks away from the Barrow defence as he looks to set up a Bulldogs attack. 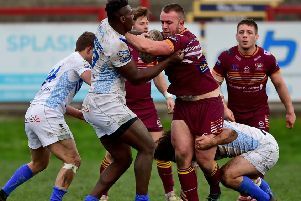 Batley Bulldogs coach Matt Diskin admitted his side gifted Barrow victory in last Sunday’s Betfred Championship opener. Batley produced an out of sorts performance as they slipped to a 22-18 defeat and the Raiders won at Mount Pleasant for the first time since 2001. Diskin was annoyed after the game and believed a number of players were not fully prepared for the Raiders threat, saying: “We were very poor, we showed a real lack of respect for the ball and probably the opposition. Diskin felt it was a game his side should have won had they implemented their game plan properly and heeded his warnings: “We gifted it to them. “It wasn’t won, we gifted it - we turned too much field position over too easily. “The tries we conceded were very poor, individual misses and offensively we were absolutely terrible. Too many errors and too lateral. “We have to have a look at ourselves as a group, our preparation - everything. “We thought we were in a good place. Dewsbury Rams saw their opening Championship game away to Rochdale postponed on Saturday lunchtime due to a frozen pitch at Spotland. Elsewhere, promoted York City Knights earned huge praise for their performance in a 14-0 defeat at home to pre-season favourites Toronto Wolfpack. Bradford Bulls edged out Featherstone Rovers 17-16, Sheffield Eagles thrahsed Swinton Lions 64-10, relegated Widnes Vikings overcame Halifax 40-16, while Leigh Centurions defeated Toulouse 24-16.